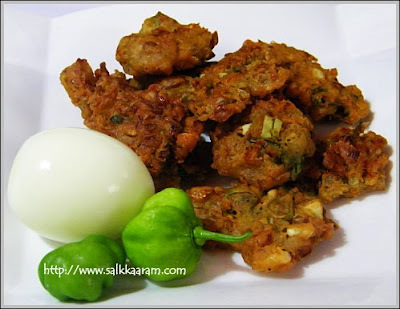 Egg Pakoda / Fritters | Simple and Delicious ! Some readers had informed me about the difficulty in getting the comments published.I could understand most of the viewers are using IE and many times the page loaded very slowly.I tried google chrome and it also showed much problems.Since long, that is from the beginning of this blog, I have been using firefox - am using firefox version 3.5.5 - and haven't faced much problems yet.I think it is the best web browser to view this site. (also for editing) If any one of you noticed problems while viewing this site, please try viewing it in firefox. And don't forget to let me know if the page takes much time to load. This week, you have a delicious egg pakoda / pakora recipe to try out.It is very easy to prepare but take care while frying, when the pakodas turn crisp it will start bursting little, (not much to worry :). So, reduce heat while taking them out from the hot oil. Chop oinon, greechillies and ginger into very fine pieces. Mix egg with all other ingredients. Don't make a very thick or thin batter. Pour spoonful or less of this mixture. Pour four or five spoonfuls. Flip over when one side is crispy and golden brown. 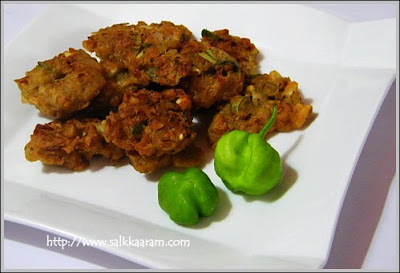 Nice looking pakoda Seena.Try cheythittu parayam ketto. Thanks once again for replying my query about mixers and food processors. Hi Seena, I might just add a little rice flour for that extra crispiness to ur recipe - curry leaves. Thanks, first time visitor, made the pakoras and lived them. Will try your other recipes soon!! I have neve rhad egg pakora , looks crunchy delicous. I ve taste egg bajji but pakodas sounds unique! hello dear :) kurachu naal india yil aayirunnu , ivide veedum medichu, so was kind of busy, but will never forget friends like you ketto :) how is life going on for you? egg pakoda looks like a perfect snack for this cold weather here. can i shallow fry it? I love egg pakoras...crisp and nice. Your version sounds too good, they look awesome. Tried it Seena.Came out very well.Very suitable for the present weather condition. Sounds a great idea to make pakodas with egg. Great evening snack with tea. I tried this recipe it came out good.Thanx for posting the recipe. First time visitor to your blog. Made the pakoras and loved them !! This! !